GG do u remember what they went for?? About $800. Not this exact model but similar design. Is it a two wheeler or three? No need to aim left. It's not too expensive if it does the job properly. After an electric buggy, I bought a second hand Parmaker 4-wheeler. It did the job ok, better than walking, but not as good as a cart. I then bought a real cart. Yes, it's cumbersome having to load it up on the trailer and take it to whatever course I'm playing. A scooter is a compromise between a cart and walking. It all comes down to what's important to you. Here is an off-road scooter without the bracket for the bag. Very true, well obviously from comfort perspective, nothing compare to cart. But it is like you say, cumbersome (impossible for me as I don't have a space to store it at home or even a trailer) and too rich for my budget. 1. No bag rack - now I can carry the bag on my shoulder, although prefer not too. And I am not that handy kinda guy to build my own rack. How is the investigating going? 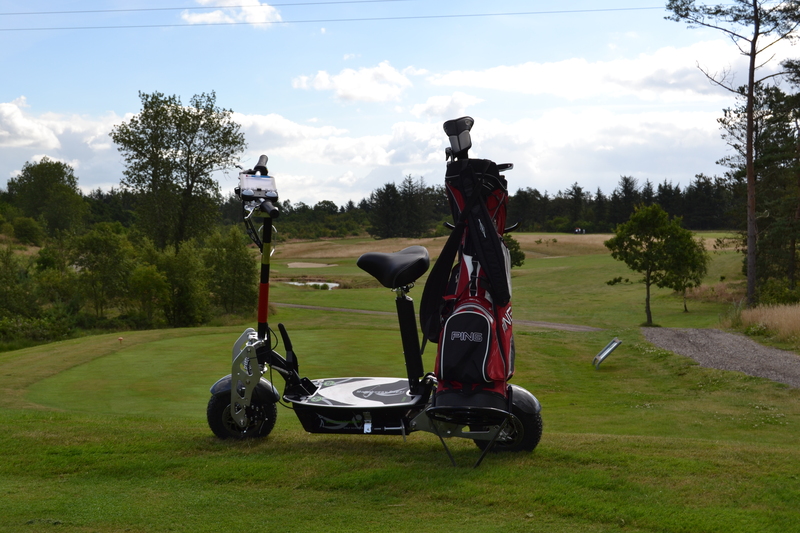 I have been doing a little more research as I think that I would like one when the foot plays up (I get gout every so often) and when I play social golf with mates that only cart (and I dont want to be the only one walking in a group if the numbers are odd). Was thinking of buying myself one of these without the bag rack, with the cheaper lead acid battery. These batteries are rated at 250-300 charge cycles which means that it will last me at least 3-5 years as I wont be using it weekly. When the batteries do give up the ghost, will then upgrade to Li-ion unit and have it last another 10, that is if I havent already decided to change up or give up golf or whatever. My brother in law is quite handy at mig/tig welding and don't think that it will be an issue knocking out something that will work at a cheap cost base. 1200W with lithium would get my vote. But I have a real cart not a kiddy toy.